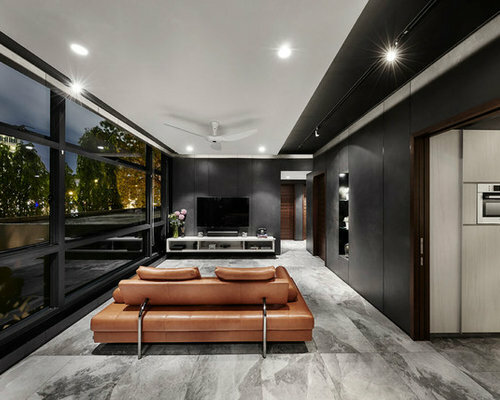 Living - Asymmetrical alignment of dropped cove ceiling subtly defines the living spaces from circulation. 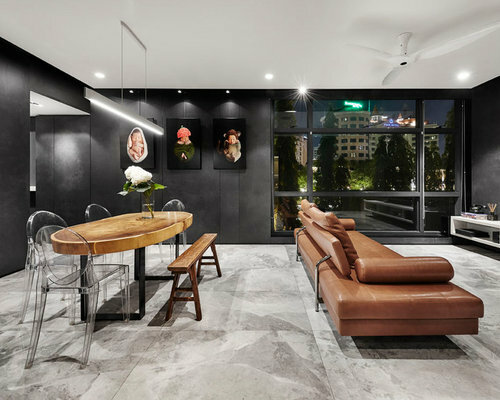 Living + Dining - Cladded in 3m tall floor-to-ceiling textured tiles in varying widths with blackened-steel inlays, the black palette created a neutral canvas that easily takes on the homeowner's existing furniture, whose rich brown hues add warmth to the cosy interior. 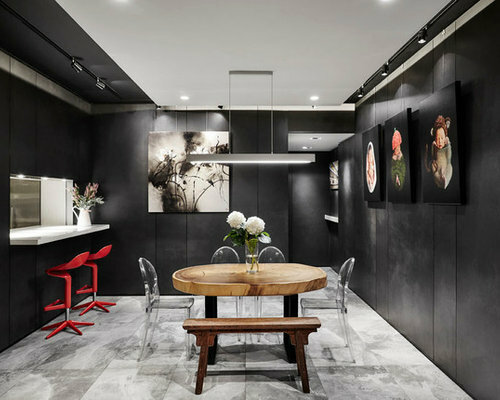 Dining - The black of the walls turn up to the recessed ceiling as well, subtly creating a feature out of the asymmetrically placed dropped cove ceiling, drawing attention away from the gallery-like track lights. 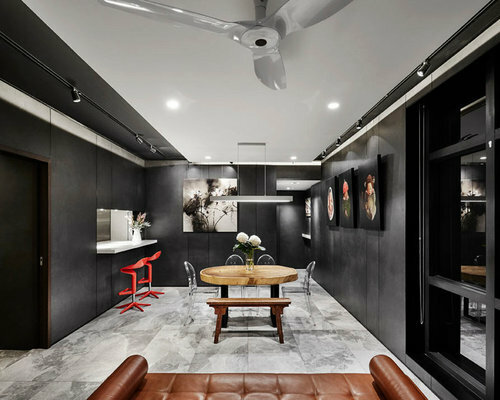 Bar - Slit carved out of the black cave-like walls bring light from both Living and Kitchen to the Dining, the darkest part of the house. It also improves the cross-ventilation within the apartment. 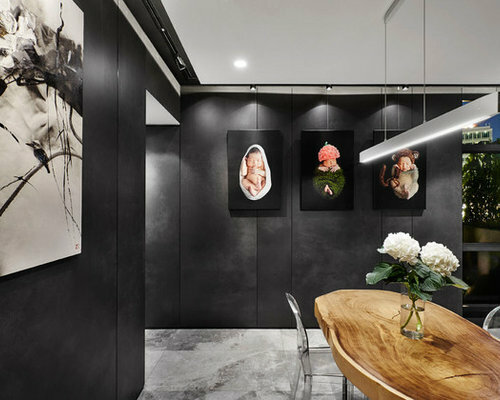 Entrance Foyer - Concealed gallery-type tracks at the top of the walls allow for flexible placement of the homeowner's extensive artwork collection via hooks and "ïnvisible" fish-lines. 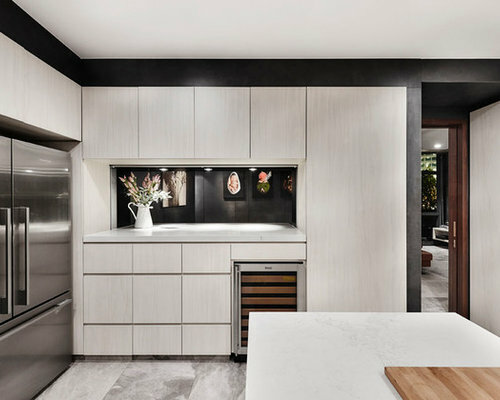 Kitchen - The Bar opening, which also allows for ease of service from Kitchen to the Dining, features a concealed window that slides down from within the walls to close off the Kitchen during heavy cooking. 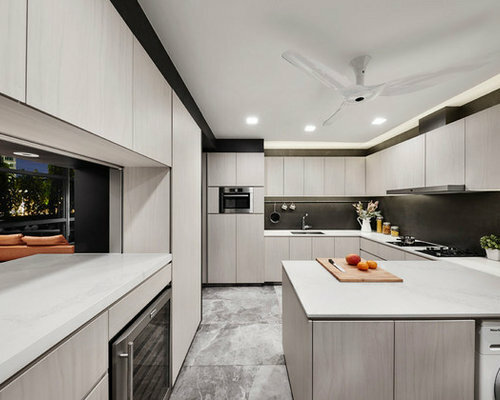 Kitchen - The original yard, wc, store and windowless kitchen were combined to create an expanded "swiss-knife" kitchen that functions as an all-in-one space, served with natural light and ventilation from the existing yard window and the new bar opening. 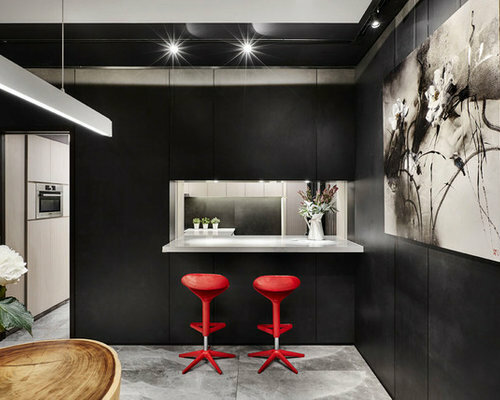 The same 3m long dark textured tiles clad the walls here, creating a continuity from the living spaces into the Kitchen. 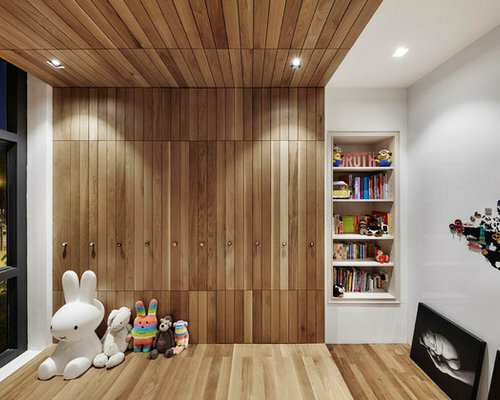 Children's Room - Concealed within the cove, the only thing to give away the existence of the wardrobe are the door knobs. Children's Room - The white wall opposite the cove is in fact a ferromagnetic whiteboard wall! Creating a fun element within the room where the children can place the many magnets collected from family holidays, and of course, for them to draw on without worrying about cleaning! 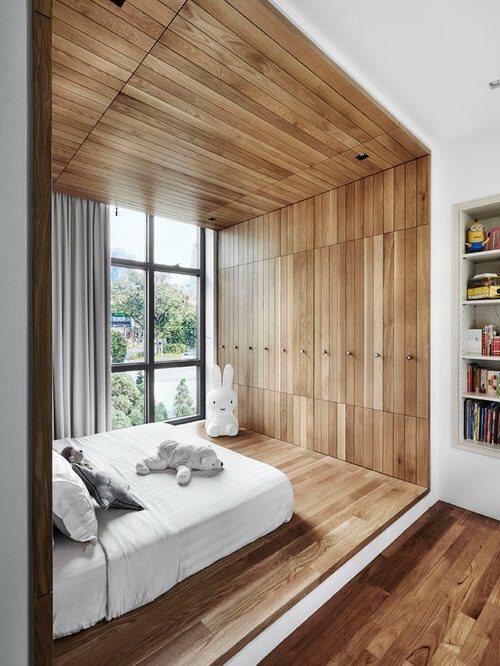 Children's Room - The timber cove creates a cocoon-like space that not only feels cosy but secure as well. Master Bedroom - The cove is also used to define the sleeping space from circulation, while subtly framing the lovely view out. 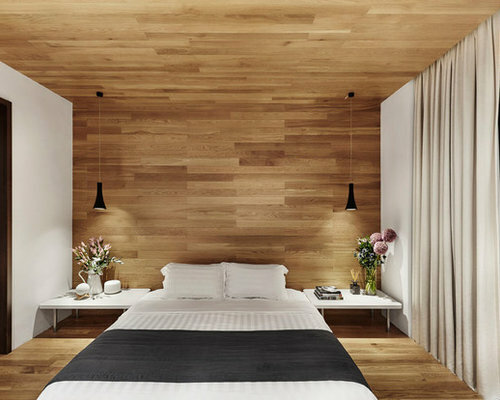 Completing the setting is the wardrobe opposite the cove, designed as floor-to-ceiling wall panels, maintaining the calm clean lines within the bedroom. 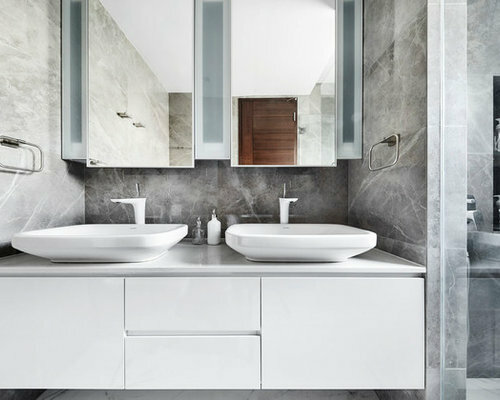 Master Bath - The existing layout of tub and corner shower were removed and the bathroom was reconfigured to accommodate hers and his basins with a larger shower complete with built-in niche for shower accessories. The mirror cabinet also features built-in lights to help with her dolling up!